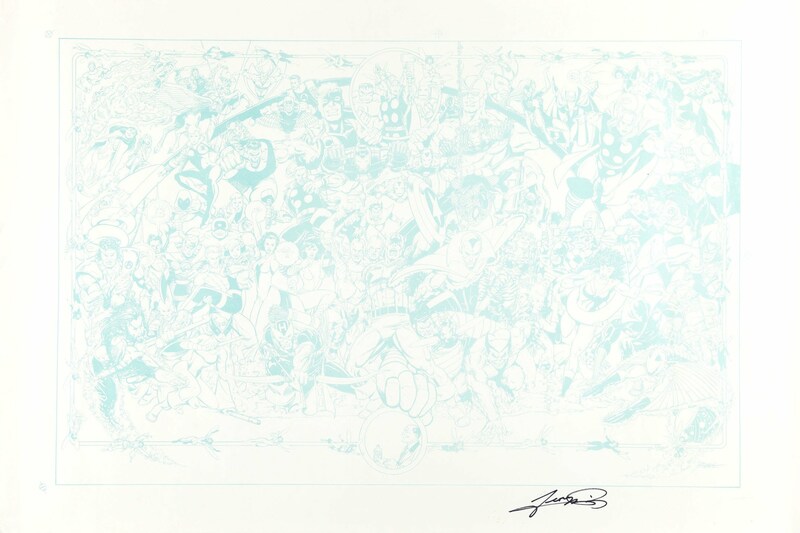 Guests: Guests includes: J. Scott Campbell, Scott McDaniel, Chuck Dixon, Frank Cho, George Pérez, Roy Thomas, Greg Land, Jimmy Palmiotti, Amanda Conner, Robert Rodi, Bart Sears, Brian Pulido, Adam Hughes and more. More Online Comics, Geroge Perez Update, MegaCon is Coming! What do you do when you're comic book art is a legend, but you are still in the prime years of production? Get someone else to manage your website at http://www.george-perez.com As announced two years ago at MagaCon Orlando, George is still working on his Avengers/Justice League cross over story. It will be 4 issues and George, as a labor of love, is penciling and inking every page of every issue. I suppose the moral of the story is that love cannot be rushed. Another moral could be to be careful what you wish for it might come true. On the website the editor says that George says he has finished penciling three issues and has laid out issue #4 and is inking the third issue. George is also working on his second issue of 2 of Solus for CrossGen. Solus debuts next month. Here's a picture of the cover of the third issue of Solus by George Perez with inks by Rick Magyar and colors by Larry Molinar. I had a terrific time at Megacon this past weekend in Orlando. This show was the debut of Astounding Space Thrills: The Convention Comics. Over the three days of the show, more than 5,000 comics were handed out to fans of AST and many, MANY new readers. Wow! Just an amazing number of people! The show opened at 10:00 am and the line stretched to the door well past 1:00 pm. The books were flying out of our hands as the crowds rushed in. It was clear that Megacon attracts a diverse crowd. Indie fans headed for Top Shelf and Alternative; "mainstream" fans sought out artists including Frank Cho, J. Scott Campbell, Jimmy Palmiotti and George Perez. There were dozens of booths selling new, silver and golden age comics, toys and videos. Game companies including Wizkids were there. Manga/Anime was a BIG part of the show. Crossgen, with the biggest booth in the hall, always had a crowd. And panels? Did someone say panels!? I sat in on several, including the one that brought CrossGen Entertainment's CEO and Publisher, Mark Alessi's words to the Internet. I find it amazing that so many people could hear what the man has to say on matters concerning the industry we all revolve within, yet not get the message nor understand that Alessi is only guilty of practicing what he preaches! Man, if we only had more leaders in publishing like him! You can find message board threads that speak towards several of the things that are lacking in our hobby and the greater industry of the comic book as an entertainment medium here on the orcafresh.net website. ACTOR announced today the results of its 2003 Orlando MegaCon art auction which was held on the weekend of February 28-March 2, 2003 at Orlando MegaCon. Over $50,000 was raised during both the silent and live art auctions which featured 190 lots donated by comic book writers and artists such as George Perez, Leonard Kirk and Alex Ross. Last week the Fund went back on the road to meet our supporters at MegaCon in Florida and to touch base with the First Amendment Community at the Free Expression Network's Clearinghouse meeting at the Freedom Forum in Arlington, VA. Read on to get the full scoop! MegaCon offered the best kind of surreality a convention can: fun guests, great costumes, good deals, and one of the strangest social brews one is likely to find in any setting. In the same weekend that a record breaking 16,000+ comics fans descended on Orlando, FL's Orange County Convention Center, a cheerleading convention, boat show, and home electronics expo were also going on, which led to one of the most entertaining scenes we've witnessed at any of the conventions in the past year. Charles Brownstein and Rowan Rozanski were inside MegaCon running the CBLDF table where we signed up new members, including a few members of the Jim Lee Century Club. There's still some spots left for those 100 signed Jim Lee cards; be one of the Fund's first hundred members to join at $100 or better and you can be part of the club too! The MegaCon floor was jam packed through the weekend with media fans coming out to meet comics stars like Steve Niles, Joe Linsner, Frank Cho, George Perez, Rich Koslowski, Billy Tucci, J. Scott Campbell, Greg Horn, Jaime and Gilbert Hernandez, Bart Sears, Adam Hughes, Chuck Dixon, Cully Hamner, Paul Jenkins, Brian Pulido, and others. To Bid on CBLDF MegaCon Donations Visit: Ebay. I don’t know what the final count was, but I do know that between the U.S. Open Cheerleading event and MegaCon 2003, the Orange County Convention Center was expecting over 20,000 people to pass through their doors last weekend, with 15,000 in mind for MegaCon alone. What that meant was that all the enthusiastic cheerleading moms from all over the country got to experience the joy of having their children surrounded by pedophiles and overweight superheroes. With that in mind, it’s with great shame and loathing that I declare MegaCon to be a world class Freak Show of epic proportions. Personally, I’m just thankful it’s in Orlando. Tampa would be embarrassed by this show; it would never fit in. There were freaks everywhere. I’m not talking about the pleasant kind of freaks either that I see on a Saturday night in the shadows, nor am I talking about the ugly and the amputated. No, I’m talking about the disturbing kind that alters your DNA. No wonder Marvel or DC won’t show their face there. I’m certain once CrossGen takes over the industry, it won’t even acknowledge MegaCon; it’ll just be another conquest to brag about. And personally, I wouldn’t blame them when they do. I’ve witnessed comic book professionals turning to therapy because of shows like this. People in the CrossGen area were fending off the freaks with wooden bats. Chris Staros from Top Shelf was in tears most of the time and Mark Alessi was rumored to have gouged out his eyes with a pencil. It got so bad that all sharp objects had to be removed from the convention center all together. The folks in Team Red Star were making sketches using Q-tips and peanut butter. 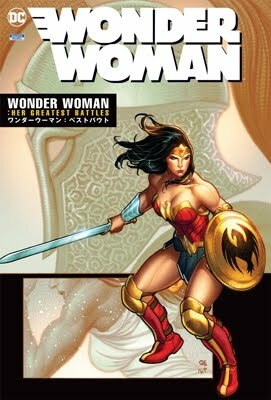 The latest comic book news from the inside! At MegaCon this past weekend in Orlando, FL, A Commitment to our Roots (ACTOR) - the charity that helps comic book talent of yesteryear in need –held their annual auction fundraiser. The ACTOR auction raised over $51,000. Creators let their hair down (except for George Perez, whose bald pate was rubbed several times). There was some amazing high bids: $3,100 for Daredevil movie film-used jacket, $2,000 for Alex Ross’s Earth X #7 painted cover, $1,900 for George Perez’s JLA/Avengers pin-up. In one bid, writer Paul Jenkins (Peter Parker: Spider-Man) sweetened the pot by offering to name drop the winner in his upcoming Batman comic! But overall, it was an original art collector’s bargain paradise. There were several items that if offered on the open market, could’ve sold for much higher, especially in the daily silent auctions. (The Wizard Price Guide Editor even picked up a few pieces and he’s one frugal miser.) One interesting tidbit, the one hostess displaying the art at the auction was non-other than Crossgen Publisher Mark Alessi’s teenage daughter. 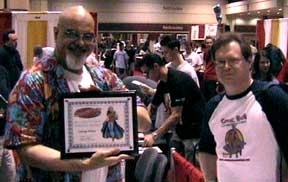 George Pérez (l) accepts his award for Convention Sketch Artist of the Year from Brian Pate (r) of Comic Book Conventions.com at MegaCon 2003. He talked at length about his problems with Marvel Comics, CrossGen's initiatives to enable as many readers as possible access to their comics and the company's film and television prospects. He also answered questions from the audience. For a rundown of Alessi's comments: CLICK HERE. Just a few quick notes about MegaCon, Day One. Jim Krueger (Universe X) is in attendance as well as comic great Russ Heath. Look for them in Artist Alley. Phil Noto is hanging out at the Gaijin Studios booth all weekend. By the way, I'm told that Adam Hughes is completely booked for sketches for the whole weekend already. George Perez is doing sketches for ACTOR --$60 for a head shot, $150 for a full figure (only 2 of these per day). Stop by Artist Alley and see Austin Janowsky, and he'll be happy to provide you with a free Comic Book Conventions.com trading card. First of all, for a weekly newspaper, COMICS BUYER'S GUIDE seems kind of slow when it comes to news. The artwork and story already appeared in a monthly magazine, WIZARD #138. I don't really buy it for the news, but they really need to work on this. I also don't like how the news are pretty much recycled press releases - which for net savvy readers you would already know this information weeks or months before it actually get printed. Anyway, the latest issue, COMICS BUYER'S GUIDE #1528 (28 Feb 03) contain an article (entitled "MegaCon Invades Orlando" by Nathan Melby) which has a little more information regarding the up-coming MegaCon convention and ACTOR. The JLA/A piece is about 2 by 3 inches, so it's just as big as the WIZARD one. What's new is the Joseph Michael Linsner's Daredevil print (which can be found on ACTOR's website under auction). George Pérez will be there. So will 20 members of the JLA and Avengers. ACTOR, A Commitment to our Roots, the only federally chartered charity dedicated strictly to helping out old-time comic creators in need, is staging its fourth charity auction at the Orlando MegaCon, Feb 28-March 2, 2003. Over 100 lots from a star-studded cast of artists go up on the block, with all proceeds benefiting the fund. Joe Quesada's "Sydney Savage" full-page pin-up from Danger Girl Special. An incredible Jeff Smith sketch featuring the famed Bone creator's take on Superman, Batman and Captain Marvel. Contributions from Sean Chen, Walter Simonson, Bruce Timm, Mark Bagley, Mike Wieringo, Dave Johnson, and many, many more! These two items from MegaCon are somewhat related to George Pérez. George is the chairperson for ACTOR and have auctioned off sketches for them in the past. A MegaCon tradition, this program is less a panel discussion than it is a fireside chat. It’s Mark Alessi, uncensored, talking about the comics industry, CrossGen’s plans, his personal convictions and just about anything else that is on his mind. Come and ask Alessi, founder and CEO of CrossGen Entertainment, the hard questions and he’ll answer them in his usual shott-from-the-hip style. Always honest, usually controversial and never shy, Mark Alessi takes the stage for a full 90 minutes in his annual MegaCon panel. The ACTOR Art Auction, hosted by MegaCon 2003, will take place in Room 315B of the Orange County Convention Center, 9800 International Drive in Orlando, Florida on Saturday, March 1, 2003 at 6:30 p.m. A Committment To Our Roots (ACTOR) is a charity organization founded to provide financial assistance for retired comic book creators. Charity director Jim McLauchlin will auction off very rare, one-of-a-kind comic book art and memorabilia. Last year, the ACTOR Auctions raised more than $170,000. George first started in comics in 1973 as an assistant to Rich Buckler, working on a back-up story in Astonishing Tales #25. His first solo assignments came a year later when he penciled the story Sons of the Tiger from the black and white magazine Deadly Hands of Kung-Fu, and Man-Wolf from Creatures on the Loose. Within a year of these stories, he was offered regular assignments on Fantastic Four, The Inhumans, and The Avengers. George has worked steadily since that time. It was his work on these large-scale team books that garnered him the reputation as the artist that liked to draw group books. During his historic career, George has worked for every major publisher, as well as some minor ones. He is best known for his work on The New Teen Titans, a series that helped turn DC Comics around in the early 80s and was also the first mainstream title to offer a royalties program to its creators. He is also well known for his runs on Wonder Woman, Marvel Comics' Avengers series, and for the maxi-series to end all maxi series, Crisis on Infinite Earths. You can now see George's work on the CrossGen Comics title Solus and the upcoming JLA/Avengers. Friday 12:00pm - 7:00pm For attendees who purchase Advance tickets. Friday 1:00pm - 7:00pm For attendees who purchase tickets at the door. CHECK BACK FOR WEEKLY UPDATES!!!! !